This BioBrick was made to understand the role of RBS and Promoter parts in giving rise to intrinsic noise in E. coli DH5alpha. 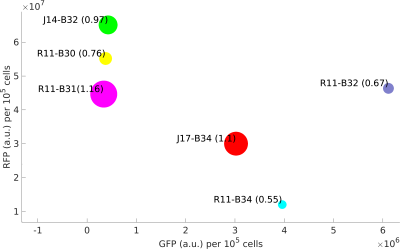 Expression data for GFP and RFP proteins were obtained using flow cytometry (BD FACS Aria III) at 3hr, 6hr, 9hr and 12hr stage of growth along with cells expressing only GFP, only RFP and none. 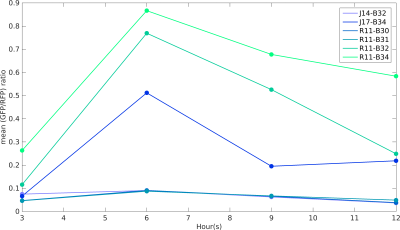 Cumulative intrinsic and extrinsic noise were measured using modified Elowitz formula. OD600 values for specific growth rate estimation were obtained using Spectrophotometer over an interval of an hour for 12 hours. Given specific growth rates are in it's logarithmic values. This BioBrick can be used to characterize noise and strength of complex devices by cloning this device with given device, which produces a different reporter protein. 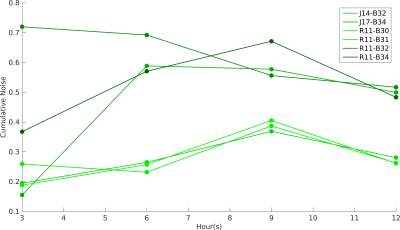 In graphs, we have R11-B32, R11-B34, J14-B3, J17-B34, R11-B30 and R11-B31.